Author of *Smoked Out*, *Greatest Gifts*, etc. Squalling children, poverty, discomfort; the everlasting excessive demands on her time, her patience, and her endurance — this was life! And the life she sought to escape, but would troubles in the big city convince her otherwise? Undoubtedly the day coach was stuffy and disagreeable. Moreover, one of the innumerable gritty particles which were continually working in around the window sash had got into Estelle Ballard’s eye. And, as if this was not enough to insure her discomfort, there was an eternal nerve-ragging duet of hopeless wailing from two grimy children who sat, or rather squirmed, about the seat and the floor, midway up the car. Under the circumstances, Estelle Ballard was not a bit surprised at the return of her too-familiar headache, the headache which, with some of her other ills, she thought she had left up there in the mountains, under the influence of the bracing air and the unaccustomed restfulness. Not even the thought of the great new adventure on which she was embarking could ward off such purely physical discomfort. Rather, the reverse was true; her mind turned easily and naturally back into the old weary treadmill. Squalling children, poverty, discomfort; the everlasting excessive demands on her time, her patience, and her endurance — this was life! At least, it had been her life for seven years. There had been enough of it, and more, to deaden the buoyant romance, in whose grip, as a twenty-year-old girl, she had married Tom Ballard; enough of it, surely, for a lifetime! Yet other people found things different; others avoided responsibility, lived in a quest for pleasures of all sorts, and found them. Other people had tasty homes, undefiled by the broken toys, tom papers, and other litter left by young savages. They had servants, money, time to enjoy the theater, luncheons in town, shopping trips — oh, everything! Only some foolish women elected to undergo the other sort of life; some like herself, and like that bedraggled, weary-faced mother up ahead, who was vainly trying to soothe her young charges into quietness. A scornful laugh came to Estelle Ballard’s lips as she thought of her attitude only a few years before, when so many of her girl friends had studied stenography, or nursing, or something else preparatory to a vocation. None of that for her! The prosaic, work-a- day prospect had distinctly not appealed. But, thanks to her father’s guidance, she had taken a commercial course, had learned enough about bookkeeping and typewriting to be of help to him in his little retail business; although she had never intended to use her knowledge in any other way than that. Drudgery of any sort had never appealed to her. She had wanted, and had frankly stated so to her friends, love, romance — life! Life! Well, she had had it! Tied down for years, with no help but her own hands, no chance to leave the house even for an evening call on a neighbor. This was the very first vacation she had had; and, instead of filling her with eagerness to be back home, it had been all too short, had made the prospect of a return bitterly distasteful. Of course she couldn’t blame Tom Ballard. It was not really his fault — not in a moral sense, anyhow — that he did not get ahead more rapidly, that he did not make the huge sums of money which she knew she could so easily learn to spend and enjoy. He was of the patient, plodding sort, the kind who would never make any startling success, unless by pure accident. He was the kind, too, for whom she did not need to dress up and appear at her best, when she was feeling at her worst. His affection was steady, unimpressed and unaltered by the things which he considered trifles, which he was as likely as not to fail to notice entirely. But that didn’t help her case any! She had little enough to thank him for, anyway; even this vacation trip to the mountains, her first, he had insisted on only at the orders of the doctor. No; Tom could hardly have done otherwise; and the vacation, itself, had only whetted her appetite for the things that she had missed. Estelle gave a start. Already? She noted with satisfaction that the mother with the two whining children was making preparations to leave the train here. And the headache which had so long bothered, began suddenly to disappear. It must be the magic of the place, she thought. For this was the junction point, the beginning of her adventure. This was the place where, under other circumstances, she would have left the train and waited in the station for the accommodation train that would take her home to Sladeville. She sat, very stiff and self-conscious, staring fixedly out the window, until the car began to move away from the station. Then she weakly relaxed and gave a huge sigh of relief. She had done it! She had not weakened, as she had feared. She was on her way to the big city — to Boston, to the new life of which she had dreamed! She seemed to have left her cares, her feeling of oppression, behind her with the flying landscape. Freedom! She was in no mood to apologize to herself for the step she had taken; she was too gloriously, deliriously happy in it. All that she had missed for years was now to be hers — hers! No one to claim her time, to circumscribe her actions, her desires. Nothing to do but to earn a living, and she had little doubt that she could do that! For that matter, a very small wage would suffice at first; the freedom alone would be joy enough. Later, she could attain a position where she could satisfy her craving for the gayer things. The children — well, they would not be so badly off as at first appeared. Tom’s maiden aunt, who was staying with them now, could continue her care of them. She might not be an ideal guardian, but neither had Estelle, herself, been. Her querulous temper, her too great proneness to scold and punish and nag, were bound to have a bad effect upon children of that age. It would be too bad for Tom, of course; he would feel her loss keenly. She’d have to let him know, of course: write him, somehow, in such a way that he could not trace the letter. Otherwise he might think her dead, or kidnaped, and waste time and money and worry in trying to find her. She could spare him that by simply telling him the truth. Boston was a large enough place so that she could easily lose herself in it; a change of name was about all that would he necessary, except to keep out of the way of people there whom she and Tom both knew. It would be hard at first, of course; but in a few months at the most, every one concerned would be that happier for it — especially herself. On the whole, they were pleasant thoughts that quickened the journey to the city. Estelle Ballard, in spite of her weeks of planning, had no very definite idea as to just what she would do first. The little money which she had been able to save out of her meager vacation allowance would hardly permit her to go to a hotel; she must immediately find a boarding house, from which, as a headquarters, she could seek work. It was nearly lunch time when the train pulled into the great gloomy shed of the North Station; she would get a paper, bring it with her to a lunch room, and scan its “board and rooms” columns while she ate. She skipped nimbly down the car steps onto the platform. In addition to her hand bag she had but a single suit case, which she found no burden at all in her new-found strength, though a bit awkward to handle in the crowd. She pushed through the throng to the nearest news stand and fumbled at her hand bag. Finally she sat her suit case down; it was too awkward, trying to open the bag with one hand. She unclasped the bag and the small pocket within it and reached for two pennies. As she drew them out a look of blank consternation was on her face. The pennies she found, and a few other bits of small change; but there should be bills there, too. She had been robbed! For a moment terror gripped her. Alone, in a practically strange city, with less than eighty cents to her name! She carefully searched the bag once more. She was not mistaken; there was no more money in it. The bills which she had so carefully hoarded were gone! 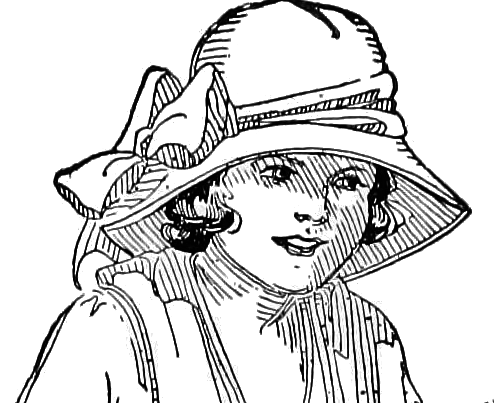 The newspaper forgotten, Estelle Ballard thrust the change back into her bag, picked up her suit case, and thought quickly. Her numbed mind was unable to accept her loss. Why, she would not even have enough to go back to Sladeville — the place which, though she had deliberately cut loose from it, she still instinctively looked upon as a refuge in case of emergency. And this was on emergency! Her quick, frightened eyes roved about the station. It must have been after she alighted from the train, while she had been hurrying in the crowd through the train shed, that the theft had been consummated. In her haste she had brushed against many people; and she would not have noticed any slight touch at the bag which had been hung over her wrist. Moreover, she was sure that the money had been intact while she was in the train. But, out of the hundreds, who could it be? How could she possibly hope to identify the thief? She had noticed none of the people particularly — none but one crippled fellow, against whom she had bumped, and then apologized when she saw that he limped. Suddenly she saw the very person she had in mind, making, with a haste which was exaggerated by his painful limp, for one of the farther exits. Without pausing to think Estelle darted after him. He might be the robber; at any rate, she purposed to find out. Now that she thought of it, he had rather clumsily got into her way, it seemed; she had forgotten the fact in her pity for him. If he were, the fact that he had not already escaped could be explained by two things; first, his limping gait, and, second, his probable assumption that she would not look in her bag until she had left the station. He could not have guessed that she would stop at the very gate of the train platform to buy a paper. Into the street she determinedly sallied. The limping youth was still in sight — thanks to a press of traffic along the street which he had attempted to cross. His enforced pause in the middle of the highway enabled her to decrease the distance between them, and when he stepped onto the sidewalk she was not far behind. He looked around furtively and saw her; his pace quickened, and he made for the doorway of a place whose fittings proclaimed it to have once been a saloon. Almost running, Estelle pursued. She spoke to him as he turned at the doorway. Almost to her surprise, he obeyed. The woman had spoken incautiously, thoughtlessly; but the youth’s sudden acquiescence indicated to her that he was indeed guilty. She fell into step beside him. Even then, she had a half-humorous thought that they must look to be an ill-assorted pair; he, with his shrunken, ill-clad body, his twisted leg, and his sallow, wizened face; she — but she, herself, Was probably not much to look at, after her seven years! “I want my money!” She spoke the words in a low voice, but decisively. Estelle Ballard’s heart sank. If he were to brazen it out she could not prove that he had her money, even if her suspicion was correct. One glance at her determined face and he weakened. He must be a very inexperienced crook, she thought, to be unaware of the strength of his position, or else a very experienced one, too well known to the police to risk investigation. “I — I!” he wavered. In his abject pleading his face looked pitiful. He was little more than a boy, after all, she thought. “How old are you?” she demanded, as he fumbled at his pocket. “Aren’t you ashamed of yourself? Don’t you know where you’re bound to end up?” She began to feel a pity for the wizened boy. “He — he did?” said Estelle sympathetically. He had produced two ten-dollar bills and a five — just the denominations which she had missed. The woman noted, too, that one of the bills was a note of a New Hampshire bank, thus confirming her belief that it was her own money. “How old were you then?” The woman took the bills from his hand. “Oh!” Estelle’s breath unconsciously made the exclamation. Five — that was the age of her own eldest boy, her Jimmy. With scarcely a “thank you,” he was gone, around a corner. As Estelle Ballard turned to retrace her steps to the station she came face to face with a policeman. Estelle Ballard set her suit case down on the walk and opened her hand bag. She made a pretense of counting the contents. She had not decided what she would do. She returned to the station, bought her paper, and went to a seat in the waiting room to open it. But the paper claimed small part of her attention. That pickpocket, that mere boy — the boy whose mother had deserted when he was a mere baby! Just the age of her own; but she was leaving two, instead of one. If the mother had remained, perhaps the crippled young fellow would have turned out differently. He would have had a chance, anyway. Not that Tom Ballard was a “bum, a no-good;” far from it. But — a father is away from home too much to have enough influence on his children. And Tom’s aunt was all right in her way, too, but unaccustomed to youngsters. Perhaps she would not care to stay, but, whether she did or not, there was just one person whom the two children needed, and would always need. That person was herself, Estelle Ballard! The things she had planned for herself in her new life of freedom suddenly seemed quite flat. Perhaps there had been more joy in the imagined foretaste than there would be in the reality. However that might be, she found her thoughts straying into other channels. She caught herself wondering if little Jim still had the faculty of somehow getting his shoes untied when he was out at play; if baby Gertrude still toddled after him in the same old way. She wondered if — but of course they did! It was only a month that she had been away from them; what was it that made it seem so much longer? Of course they were the same, hadn’t changed any, or at least but a very little bit. Did they ask for her at night as they were tucked in bed ? Did they cry, as they used to do, every time she had planned to go out for the evening, until she had practically given up ever going out? They had tied her down so, but they had tied her with bonds which reached the heart. She found herself on her feet, making her way to the information window; she heard herself asking, almost without volition, a question. Sladeville! It somehow didn’t seem quite so drab, after all, not when she thought of that crippled boy who had picked her hand bag. She still had enough money to get back — back home. But not, of course, if she had to pay a hotel bill to-night. She bethought herself of Joe Burrows and Madge. Madge was an old schoolmate of hers. She could go and see them; no doubt they would invite her to stay the night. To insure that they would, she postponed her call until late in the day. The intervening time she spent at her almost forgotten lunch, and at a picture show. The pictures did not interest her greatly, somehow, though she had few opportunities of seeing any. Yet she felt a sense of restfulness, of satisfaction with the world. Was it because of her act of charity to the crippled youth at the station? Or was it because she was going home? She found Joe and Madge, in the evening, at their three-room Commonwealth Avenue apartment. They were cordial enough, to all outward appearance; yet Estelle Ballard felt out of place with them. They were too urbane, too unreal — too bored, perhaps. Joe suggested a show, as if that were the only proper sort of entertainment which could be devised for a visitor. When Estelle admitted that she had spent the afternoon at one — without a thought that the movies might not be Joe’s idea of a show — her hosts hastily arranged to get a fourth hand for a game of bridge. As the game almost silently progressed, Estelle Ballard could not help feeling that the rest of the party were probably as bored as she, herself, was. This was the sort of thing that she had dreamed of, yet it was unutterably flat and distasteful to her. The apartment was too precise, too gleamingly luxurious and orderly. There were no scars on the chairs, no pencil marks on the wall paper. At home, now, every article of furniture had its own history, a history recorded in scratches and dents. And it was too unnaturally easy, too monotonous, to sit down after supper with nothing to do but amuse one’s self — no little ones to put to bed, to get drinks of water for. It was dull, that was it. Madge and Joe had never had any children; they had become accustomed to living for themselves only; they had become dull, too. Sleep was a welcome relief to Estelle Ballard that night. The davenport in the living room was a fairly comfortable bed; and it was there that she slept. Her predominant feeling before sleep claimed her was a great loneliness; a single afternoon and night of the longed-for irresponsible life had been plenty for her, was driving her back gladly to take up the burden. In the morning, after breakfast, she departed earlier than she needed to. With thanks for their hospitality, with invitations to come and visit her in Sladeville, invitations which she knew they would never accept, she departed. She went straight to the station; nothing in the city, nothing in the world, could tempt her interest now, in the prospect of her journey home. The train was made up at last Estelle was one of the first to board it. She sat quiet, while the car gradually filled; sat with folded hands, gazing idly out the window. But her thoughts were far from the gleaming tracks, from the hurrying baggagemen who were rushing trucks about. She was not shaken from her revery until a bump signified that the engine had been attached, and some one slipped into the seat beside her. “Business?” asked the woman. She smiled at Tom and pressed his hand warmly. He was smiling back at her, affectionately, but proudly, too. She could read his face like a book; her years with him had taught her that. He had a secret of some sort, she knew; a secret which impatiently awaited utterance. “Really!” Estelle did not need such news to make her happiness complete; she was going home, where she belonged; that was enough. Yet Tom’s advancement to a superintendency had — well, pleasing possibilities! He forgot about pressing her for her reasons for being in the city. She was glad of that; he need never know. Even if he did, later, it would make no difference; she had learned her lesson, had made the right choice; he would never think the less of her for that. It was only when the countryside, visible through the train windows, began to take on the familiar appearance of home surroundings that the new job exhausted itself as a conversational topic. Then Tom, with a laugh, pointed to an item in the city paper which he had held on his lap throughout the journey. Estelle Ballard leaned over and read the item. “‘Limpy’ Lannigan, notorious pickpocket and sneak thief, was arrested this morning in a down town subway station, after he had seized the purse of a seventeen-year-old salesgirl on her way to work. The girl’s presence of mind in following him to the street, after noticing her loss, coupled with the infirmity from which he gets his nickname, prevented his escape. “Lannigan is an old offender, and has done time on four occasions in the past. Aside from petty theft, his specialty is begging. In that role, with his twisted leg and the underfed air of dejected juvenility which he is able to assume, he has wheedled the charitable public of this and other cities out of large sums, in the past. She passed the paper back. “What’s that?” asked Tom, mystified.